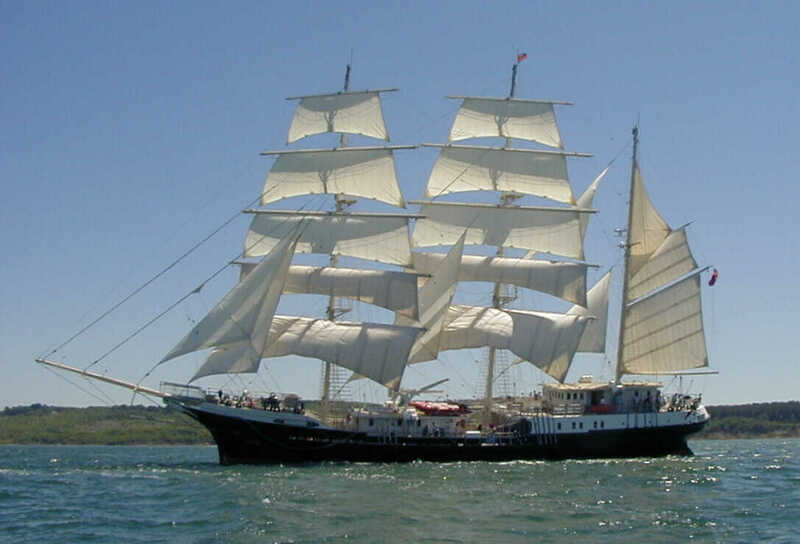 The Jubilee Sailing Trust's new training ship Tenacious undergoing sea trials in the Solent - the Isle of Wight is in the background. There was a strong outgoing tide (left to right, westwards) with the light wind also from the east, and she seemed to be having trouble tacking - at this point she was actually in irons. We were sailing in the same direction, but our Bermuda rig could get much closer to the wind and we were able to make against the tide enough to get nearly to Newtown for lunch. This was actually back in June, but she did make a good picture... (We think this must be the same day as the photos on JST's home page). Contact us: information@collingridge.net with the word "information" in the subject line. Photos taken on Olympus Camedia C960 digital camera: 1.3 megapixel, x 3 zoom - handy and easy to use but not that robust. Detail reduced for internet using Corel Photo House and Corel Presentations.